I first heard about the 2010 book Matterhorn from James Fallows in this post. Then, one of my favorite uncles, Steve, said he was reading an incredible book that happened to be called….Matterhorn. With recommendations from James and Steve, this book was two-for-two on my recommended-by-incredible-people list. I live in Washington, DC, and I often run on the National Mall. Sometimes, I take a small detour and walk past the Vietnam War Memorial. I know it is supposed to be a powerful memorial; that it is the masterpiece of Maya Lin; that it was controversial and bold when first constructed and is now beloved for being unafraid to permanently engrave the reality of war’s deadliness into the collective memory of Americans. But, I do not recognize a single name. I do not personally know a single Vietnam veteran. I have had more conversations with middle-aged Chinese people about their experience during the Cultural Revolution than I have with middle-aged American people about their experiences serving in the Vietnam War. The Vietnam War just does not seem to come up in conversations; it only comes up in classrooms. Some things like the Vietnam War, however, cannot be understood merely by reading a cause-and-effect historical synopsis. So, I usually just pretend to be affected by the black wall of Vietnam, even though all the names are an alphabet soup of complete strangers. Matterhorn provides personalities and emotions to supplement the names. 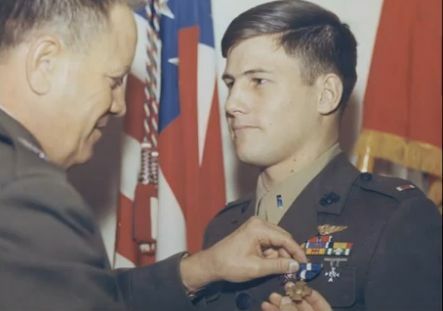 A graduate of Yale University and a Rhodes Scholar at Oxford University, KARL MARLANTES served as a Marine in Vietnam, where he was awarded the Navy Cross, the Bronze Star, two Navy Commendation Medals for valor, two Purple Hearts, and ten air medals. This is his first novel. He lives in rural Washington state. First, and most importantly, score one more for Washington State as the best state in the Union. But second, this synopsis does not tell you that Marlantes spent 30 years writing and re-writing this book. He submitted it originally in the late 1970s and publishers uniformly rejected his copy. He tried again and again, but there was always something wrong with the timing or the content. It was a story, some publishers argued, that the public does not want to hear. Now we have the chance to hear. The protagonist, Waino Mellas, is a recent graduate from Princeton University. He is hardly a year older than myself and perhaps you, and he is a platoon commander in direct command of a dozen or so soldiers. We have to decide how to fulfill our final history requirement; he has to decide who will take the dangerous night patrol and who won’t; who will live and who will die. Some of the experiences are so ghastly and horrifying that I would not believe much of it if Marlantes had not experienced it personally.The story relives the war in vivid, uncompromising, and human detail. But like most great books about war, its themes extend beyond the boundaries of the conflict it depicts. Matterhorn comments on bravery and pride, on love and authority, on the camaraderie of soldiers, the class and race divisions of the 1960s, and, yes, the base senselessness of the Vietnam War. Mellas swallowed and looked open-mouthed at Jackson. “Being racist helps you and it hurts me.” Jackson looked out at the distance. They were both quiet. Then Jackson said, “You know, China [another soldier]’s really got it right. We got to overturn a racist society. No easy thing.” (page 430-31). 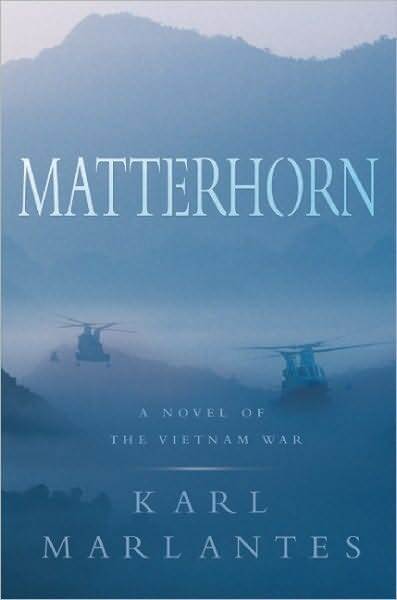 And yet, while Matterhorn will likely harden opposition to the Vietnam War amongst readers, it also inevitably ingrains a deep respect for Vietnam veterans. Given the formal separation and distance between soldiers and civilians, it is easy to forget that soldiers are not wired differently–somehow more tough, less emotional or less concerned about the moral implications of the very war in which they fight. That they, in many cases, have little option but to follow orders. That they have seen and done things that may take a lifetime to reconcile. Mellas wanted to reach out across the Pacific and apologize. He didn’t remember her name. She didn’t know he was in a hole about to die. War was breaking life apart and splintering it, so there was no second chances and all the first chances were wasted. Mellas also saw Anne crying. She had turned her back on him their last night together. How could she be crying? But now he’d never be able to explain how he felt, explain how it hurt, find out why she did it, apologize for his lack of understanding, or cry out at her for hers. They were torn apart and separate, with no second chances. To understand the long history of the book Matterhorn is to understand the definitive life experience of Karl Marlantes and the potential importance of the twenties. The experience of Mr Marlantes forty years ago, and the experience of soldiers in Iraq and Afghanistan today, is a reminder that our twenties is not merely a decade of spontaneity and exploration–it can also be a decade of serious sacrifice and life-altering decisions. For Marlantes, it is not an exaggeration to say that it took the subsequent three decades to wrestle with the scenes and emotions imprinted into his mind in his twenties. This book is worth reading for lots of reasons, not the least of which is that is shows that age really is just a number, and that people–if forced to–can ‘grow up’ and lose their youth in a matter of days or even hours. Chris’s fb link sent me here. Well-written review with heart, and I just sent it to a Vietnam vet friend of mine. thanks. I will. Like reading your writing, and your perspective. Ok, now I’m feeling compelled to read Matterhorn. In war movies, I can close my eyes at the gory parts and tell myself that scenes are embellished and that is the license of a director. It doesn’t sound like one can do that with this book. Hey David, I just finished Matterhorn. I got so pissed out when they were sent out without food I almost didn’t finish reading it. I could almost feel the mud, rain and rot throughout the story. There were so many levels that made me angry about this story, political and racial. I was not a fan of Simpson or Henry. I was a big fan of Vancouver, Hawk and the just the grunts. It made me thankful that I just missed the war. Yeah, Jay, I couldn’t believe the no-food part of the book. Unreal–hard for me to go more than about 3 hours without eating. Vancouver was my favorite character too—-have you read any good books about the Iraq or Afghanistan war? I still gotta see Hurt Locker…heard that movie was good. Thanks for the review. Enjoyed the plug for Washington State (lifelong resident here).